To start with, here's an excerpt from a post I'd written a short while ago around disruptive social innovation. "Disruptive innovation is about creating something that fundamentally shifts the way things are done. Using analogies from Systems Thinking, the whole world is a complex web of interactions that localise around tightly linked processes that are all loosely linked to other localised processes. Disrupting the norm in one small area then, can have a follow on effect to the way the whole world works." 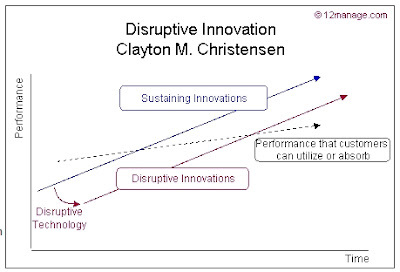 The guy who's written the most around Disruptive Innovation is Clayton Christensen. Here's a snapshot of his model. One of the more interesting books on innovation is the Medici Effect, which you can download for free off the web. Other concepts worth looking at in relation to disruptive innovation are Design Thinking and some of the principles behind User Centred Design. I'll cover these a bit more in a future post.